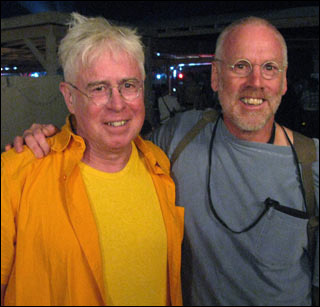 27 August 2009 - Canadian songwriter Bruce Cockburn is known as much for his political activism as he is for his music. His song, If I Had a Rocket Launcher, was written after he visited Guatemalan refugee camps in Mexico that were attacked before and after his visit by Guatemalan military helicopters. Cockburn, who has made 30 albums and has had countless hits, visited another war zone this week: Afghanistan. And the conflict involves a member of his own family. His brother, Capt. 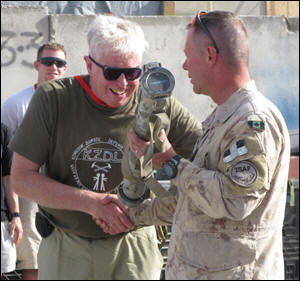 John Cockburn, is a doctor serving with the Canadian Forces at Kandahar Airfield. "I was very curious. I have my own reasons aside from national pride and the love I feel for these people," said Cockburn, 64, who has a long history of being outspoken about human rights. "The older I get, the more I see these young faces doing what they are doing and the chances they are taking — they feel like my kids." Ottawa-born Cockburn has travelled to many countries, including Iraq and Mozambique, and written songs on political subjects ranging from the International Monetary Fund to landmines. Arriving in a land that is rife with landmines, and with Canada in the middle of a war and with soldiers dying in the war-torn country, has given him pause to think. "It's a long discussion on whether we should be in Afghanistan — whether anyone should be in Afghanistan," he said thoughtfully. "But since we are, and since we've gone this far, I don't think it's appropriate to leave at this stage. "Certainly I have not had the idea that anyone I have talked to among these soldiers is hiding anything or been trying to slant things to a particular point of view," he said. "They believe in what they do and are witnesses to what they are doing, and I have to accept the truth in what they're telling me." Cockburn spent some time visiting with his younger brother, John, 57, who joined the Canadian military two years ago. The former Canadian national ski coach was looking for something new to do. "I had done a stint volunteering in Rwanda and it was the first time I really got a sense of the military and their medical role," John Cockburn said. "I thought I would be too old to join, but I wasn't, and I was interested in coming here and it all kind of worked." Big brother Bruce was supportive about his decision to join the military. "He was jealous," he said with a laugh. "He has always been interested, even as a kid, in military issues and hardware and explosions. "I think that's just remained and, with all the various exposures he's had to conflict zones, I think he's accepted the reality that the military is necessary, like it or not." 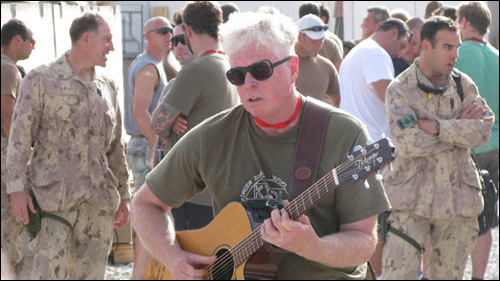 Bruce Cockburn, along with other entertainers — including the group Finger Eleven and sports celebrities such as Guy Lafleur and Patrice Brisebois — got a rare look "outside the wire" of the main base in Kandahar when they were flown to a number of forward-operating bases in the Panjwaii district. The reality of war hit home as the Canadian military responded after a suicide bomber blew himself up near a police vehicle in a bazaar in the nearby village of Bazar-e-Panjwaii. Six police officers and three civilians were injured in the attack. The experience was an eye opener for the members of Team Canada visiting Afghanistan. Cockburn drew wild applause when he sang If I Had a Rocket Launcher, which prompted the commander of Task Force Kandahar, Gen. Jonathan Vance, to temporarily present him with a rocket launcher. "I was kind of hoping he would let me keep it. Can you see Canada Customs? I don't think so," Cockburn said, laughing.